Mario Carbone and Rich Torrisi’s nod to the Lower East Side’s legacy. It’s known among the cognoscenti as crostini alla Russ & Daughters, and is a rotating dish on the restaurant’s $75 seven-course menu. 250 Mulberry St., nr. Prince St.; 212-965-0955. Buttermilk-brined turkey, sage mayo, and good bacon on an “everything” croissant. Believe it or not, chef Rob Newton, the brains behind this excellent idea, grew up in the bagel-bereft state of Arkansas. $9; 343 Smith St., at Carroll St., Carroll Gardens; 347-294-0292. It’s smoked salmon, cream cheese, red onion, and rice wrapped in a sheet of nori and looking not unlike a savory ice-cream cone with “everything” sprinkles. $6; 135 First Ave., nr. St. Marks Pl. ; 646-476-3100. 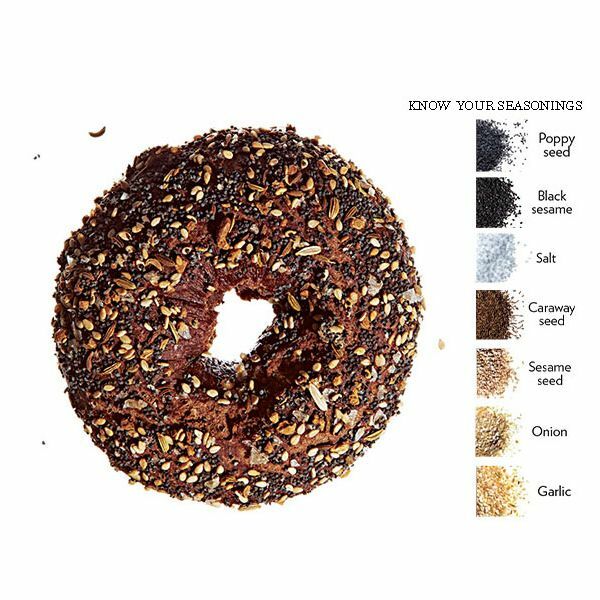 Outside this billiard-size ball of dough, you’ll find the usual mix of seeds and spice; inside there lies a stealth bacon-scallion-and-cream-cheese filling—an everything bagel trapped in the body of a jelly doughnut. $3.50; multiple locations. After dabbling in “everything-bagel” spring rolls, Dale Talde has moved on to unleavened Indian flatbread. $4; 369 Seventh Ave., at 11th St., Park Slope; 347-916-0031. Not to be outdone by Messieurs Torrisi and Carbone, Daniel Humm makes a spice mixture of his own and calls it an “everything crumble.” It’s part of his $195 tasting menu. 11 Madison Ave., at 24th St.; 212-889-0905. No less an “everything” innovator than Wylie Dufresne is a fan of this stupendous Crif Dog creation (deep-fried frankfurter, chopped scallion, “everything” seeds, and a shmear) invented by bitters guru and former PDT bartender John Deragon. $3.75; 113 Saint Marks Pl., nr. Ave. A; 212-614-2728. Jewish appetizing meets Brooklyn artisanal pasta making. How New York is that? So much so, the New-York Historical Society has seen fit to sell the stuff at their museum store. You’ll also find it at Brooklyn Victory Garden for $8.99 a sixteen-ounce package; 920 Fulton St., nr. St. James Pl., Clinton Hill; 718-398-9100.